ZF CEO Stefan Sommer: A top priority for 2015 will be integrating ZF and TRW, not acquiring more companies. "It will be the major part of future development technology." MOTEGI, Japan -- German supplier ZF Friedrichshafen AG, which agreed to buy TRW Automotive Holdings in September for $13.5 billion, expects the combined company's sales of driver-assist safety systems to grow 15 to 25 percent a year. Those technologies, which will underpin tomorrow's autonomous cars, also will be the "major" part of the combined company's $2.1 billion r&d budget, ZF CEO Stefan Sommer said. "I expect it will be the strongest growth technology in the total product portfolio," Sommer said this month at a racing event here, just north of Tokyo. "It will be the major part of future development technology." The merger, which Sommer expects to close in the second quarter of 2015, combines ZF's expertise in hardware such as transmissions and chassis systems with TRW's in software-driven active- and passive-safety and steering technologies. Sommer said it was too early to give a detailed r&d investment plan for the combined supplier, which would rank as the world's No. 2 partsmaker behind German rival Robert Bosch. But it will be an r&d juggernaut. Besides their mammoth development budgets, TRW has 13 test tracks and 22 technology centers worldwide on top of ZF's eight r&d hubs. The companies plan to set up joint r&d projects in certain areas and exchange employees in North America and Europe. "We will establish cross-divisional projects, or common projects, between TRW and ZF to develop this new kind of technology," Sommer said. He added that the companies also will commonize such activities as their aftermarket business. As part of its r&d rampup, ZF is planning to build a technical center in Japan, which would complement the one TRW has in Yokohama, south of Tokyo, he said. ZF aims to finalize the location and size of the facility next year and have it up and running within five years, he said. It likely will focus on power electronics, actuators, electric motors and hybrid systems. The combined company will have enough bandwidth to be "almost on eye level" with Bosch and Continental in driver-assist systems, dynamic-control technologies and advanced safety systems, Sommer said. But there are still holes to plug. For example, TRW's active-safety system lacks a stereo camera, Sommer noted. That technology offers better range-finding capability and is offered by rivals. "If you look at TRW, they are almost like a fast follower," Sommer said. "They do not cover the whole technology range." 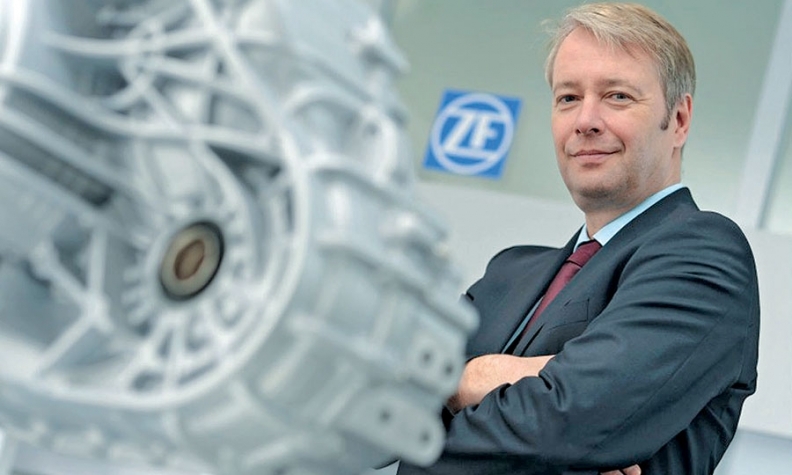 One thing ZF won't be rushing into: more acquisitions. Sommer said a top priority for 2015 will be integrating the two companies, not buying new ones. Instead, ZF will pursue joint-venture projects in areas where better coverage is needed. He cited China as a market particularly ripe for this. The Asia-Pacific region will remain a weak point for the combined company, expected to generate just 18 percent of its global revenue. North America is forecast to contribute about 26 percent of total sales, while Europe would account for 51 percent.